Halloween may be over, but the ‘claret continues to flow’. 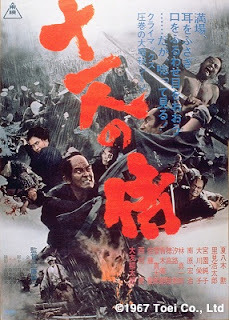 It’s another dose of in-your-face, bloody group vengeance in Animeigo’s release of “Eleven Samurai” (“Ju-ichinin No Samurai”, Toei 1966) the final film in Kudo Eiichi’s “Samurai Trilogy”. 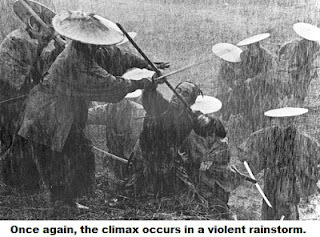 The first two films in the trilogy, the original “13 Assassins” and “The Great Killing”, both featured meticulous plans to ambush the numerically superior enemy. They’re often compared to Kurosawa Akira’s “Seven Samurai” for this reason. “Eleven Samurai” also includes this aspect, but this is after all Japanese film-there’s no guarantee that the third time will be the charm. 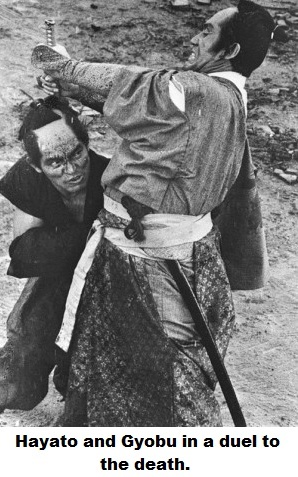 With an army of samurai retainers forming the opposition rather than the Kurosawa film’s ragtag band of bandits, seven samurai would not be enough. Bring on the Eleven Samurai! The film wastes no time getting the plot rolling. The time is 1839 and Nariatsu, brother of the Shogun and Lord of Tatebayashi (who is shown in Animeigo’s historical notes to likely be modeled on Matsudaira Nariyoshi, who died under vague circumstances in 1839), is out hunting for sport. Angry over the day’s poor catch and his poor performance with the bow when shooting at a deer, the Lord charges after the fleeing animal and despite warnings from his vassals continues his pursuit across the han boundary into the neighboring fief of Oshi. When an elderly woodcutter climbs onto the side of the road and attempts to help his wife clamber up, Nariatsu’s horse is spooked and stops the pursuit. An enraged Nariatsu instead chases down the peasant and strikes him down to the horror of his vassals. In one of those incredible coincidences that only happens in film, the Lord of Oshi, Abe Bungo-No-Kami Masayori, just happens to be riding nearby and chastises the petulant Nariatsu for entering his fief without permission and setting a poor example by striking down the peasant. You know something bad is going to happen when Nariatsu nervously fingers an arrow on his bow…and sure enough, even though Masayori states he will overlook the infraction because of Nariatsu’s high status, the arrow finds flight and buries itself in Masayori’s eye. Nariatsu retreats back to his own fief, leaving the dead Masayori’s vassals to seek legal redress for the cowardly act. However, it’s GOOD being Shogun-or even his brother. Not only does the Bakufu ignore Oshi fief’s request that Nariatsu be punished, but Chief Minister Mizuno Echizen concocts a twisted version of the incident that has Masayori invading Nariatsu’s fief and being killed by a ‘stray arrow’. As punishment for this imagined crime, the Oshi fief is confiscated. Oshi Minister Tatewaki manages to put off the confiscation of the fief for a month by telling Echizen that he needs the time to bring the vassals under control, implying that otherwise there will be ‘rash acts’ of violence against the Bakufu. Instead, Tatewaki plans to use his month to have Nariatsu killed, an act which would likely lead to a reversal of Echizen’s decree. 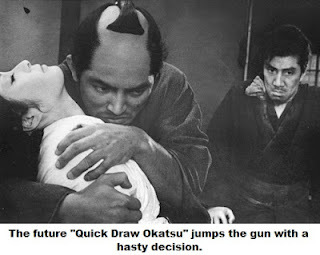 You see, much like the earlier two films, the Bakufu would cover up the assassination in order to not appear impotent-and that would necessitate not taking the Oshi lands. Tatewaki enlists his childhood friend, Sengoku Hayato, to put together a team and plan the assassination. Hayato figures he’ll need about 10 good men to pull it off. He takes a unique stance on finding them-he has clan officials notified that no harm must come to Lord Nariatsu and that anyone who does otherwise should be ordered to commit seppuku. When this inevitably happens, Hayato confronts the group and when they proceed to attempt to carry out their sentence, becomes convinced of their courage and recruits them to his cause. The addition of the ‘hotheads’-leader Mitamura, Hoshina, Aragane, Kuga, Adachi, Junnosuke, and Lady Nui (who was fulfilling her dead brother’s promise to join the group)-swells his ranks to eight. Needing money to carry out their plan, they recruit a clan accountant, Ichihashi Yajiro. The nine set out separately for Edo to catch up with Lord Nariatsu. As if he hasn’t already established himself as a Grade A scumbag, he’s traveling to Edo without permission to demand that the confiscated Oshi fief be added to his own! Upon arriving in Edo, Nariatsu continues to add to his resume by ducking out of his mansion and visiting the red light district in Yoshiwara, stumbling around in a drunken stupor with half the area courtesans and geisha in tow. Hayato’s group decides to take this opportunity to strike at Nariatsu while he’s undefended. They lay in wait for him at the stairs of the Geisha house he’s staying at. However, when Nariatsu proves to be too drunk to climb the stairs and tumbles down them (earning the title of “Brick McBurly of his Day”), giving him just enough time to be saved by the arrival of his Chamberlain Akiyoshi Gyobu. Gyobu is not convinced by the stories out of Oshi that Hayato’s group was sentenced to seppuku or exiled for stealing clan funds. Despite a constant stream of abuse from Nariatsu (who at one point in the film tells Gyobu he’d rather take the risks than bother with listening to him), Gyobu continues to do his best to protect his Lord-because, y’know, that’s just part of the whole filmatic Bushido thang. Gyobu’s not the only one struggling with the contradictions of Bushido. Hayato’s group takes refuge in an old dwelling where the hothead faction clashes with Hayato over how things are being handled. They accuse him of being standoffish, happy to set up shop with Lady Nui and not taking the opportunities presented them. Things seemingly get worse when it’s revealed that a scruffy ronin, Ido Daijyurou, has overheard their conversation and deduces what their objective is, but he proves sent from the gods when a group of Nariatsu’s samurai suddenly attack. With his help, the Oshi ronin make their escape. After returning home, Hayato is confronted by his brother in law, Kyonosuke-and Hayato’s wife Orei. The two can’t believe that Hayato suddenly disappeared and set up shop with another woman. Kyonosuke declares Hayato a disgrace and sets off to kill Lord Nariatsu on his own. However, the Tatebayashi samurai have expected an assault and capture him easily, torturing him before Lord Nariatsu kills him. Hayato has attempted to prevent his assault, knowing it will likely bring about the immediate confiscation of Oshi Han. He fails and returns crestfallen to Orei, who has heard the entire story of what’s going on from Lady Nui. Her faith in her husband restored, they have a touching interlude that ends in unexpected tragedy. Daijyurou reappears and is finally accepted into the group, giving them ten. Lord Nariatsu, having gotten a promise that he will be awarded Oshi fief, prepares to return to Tatebayashi. Hayato’s group decides to make their stand in an Imperial forest east of Edo along the steep hillsides flanking the narrow road through. They set up an elaborate ambush, planning to separate and trap Nariatsu’s procession by dropping trees into their path. Using Daijyurou’s knowledge of gunpowder weapons, they make bamboo cannons to shell the assemblage before attacking on foot. It seemingly can’t miss! But back in Edo, Elder Echizen and Gyobu scheme to ensure Nariatsu’s safety. They infer to Chamberlain Tatewaki that the decision to confiscate the fief will be rescinded, and that if anything were to happen to Lord Nariatsu, the original verdict would instead be allowed to stand. Tatewaki sends his aide Todo to the site of the ambush with the news, ordering the assault to be called off. This brings the group to 11, but also presents them with a huge decision to make. Should they ignore the order and continue with their plan to avenge their lord? Or is the fief’s survival paramount? The film cleverly allows them to ‘try’ both, but you’ll have to see for yourself how that little trick is pulled off. The film superficially resembles the previous two ‘Samurai Trilogy’ entries, “13 Assassins” and “The Great Killing”, but in spirit is more akin to a Chushingura/47 Ronin film. Here the samurai are working outside the law to gain revenge for the death of their Lord and the subsequent confiscation of their fief (an insult compounded by having it awarded to the man who killed their Lord in a fit of pique). It’s particularly mirrored in the moral dilemma of whether to work towards revenge or the restoration of their clan. Much of the cast for “Eleven Samurai” had appeared in the previous two films-two of them, Satomi Koutaro (playing Mitamura Kenshin, leader of the hotheads) and Nishimura Ko (playing ronin Ido Daijyurou) are probably best known for essaying the title role in the “Mito Komon” TV series. Suga Kantaro is the surly Nariatsu, in effect reprising his role from “13 Assassins”. While at times he goes a bit over the top in acting despicably, he certainly succeeds in making his character come across as an entitled, petulant and sadistic rich boy who takes everything for granted and treats even his vassals as disposable objects. This is one guy you really, REALLY want to see get killed. Otomo Ryutaro played the evil lord’s loyal samurai Akiyoshi Gyobu after being the prime baddie in “The Great Killing”-he also appeared in the first example of ‘samurai group assault’ films, “Seventeen Ninja”. Having a cast that was used to working with the director and each other gave the film solid performances even for the smaller parts. One of the more interesting aspects of the film is the portrayal of the relationship between Hayato (Natsuyagi Isao) and Orei (Miyazono Junko). It’s very affectionate and much more up-front than similar relationships in most chanbara films and is given a good chunk of time to play out as a subplot in the film. Shots of Hayato’s hands lovingly caressing Orei’s face and his obvious sense of shame when she believes him to have taken up with another woman give a real sense of two people who care deeply for each other. Someone at Toei obviously thought so, as the two went on to appear together in “Samurai Wolf” and “Samurai Wolf II”. Miyazono later starred in “Quick Draw Okatsu”, one of the best ‘swordswoman’ films to come out of Japan (not to mention costarring the awesome Oshida Reiko as a ninja babe). Natsuyagi is still active in Japanese film, recently appearing in the Azuchi Castle/Nobunaga jidaigeki opus “Castle Under Fiery Skies”. Director Kudo seems have to found the perfect balance in his third effort at a ‘group assault’ film. “13 Assassins” was cold and calculating, precise and surgical in its planning and counter-planning. “The Great Killing” was an exercise in chaos, from the opening that drew in a character totally unrelated to the plot to the closing assault that didn’t look at first to have succeeded. 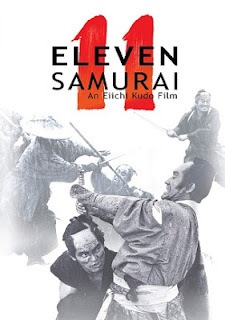 “Eleven Samurai” blends these disparate approaches and adds the Hayato/Orei relationship, an aspect that was somewhat missing in the first two films (especially 13 Assassins). There are some excellent shots and composition in the film, particularly in the massive, almost expressionistic Imperial forest that the ambush is to take place in. Light and shadow is used to great effect and there are nice flourishes, such as letting a billowing wave of fog effect a virtual wipe of the screen. Kudo is also smart enough to give his leads a bit of screen time to flesh out their characters, not just the Hayato/Orei/Nui angle but Hayato’s position as an outsider among the ‘hotheads’, Gyobu’s travails as Nariatsu’s Chamberlain, and Daijyourou’s scathing indictments of the samurai lifestyle. The music is composed by Ifukube Akira. While it’s striking, powerful, and does a good job underscoring the events onscreen, it sounds far too much like his memorable score for the classic “Godzilla”. While we’re no music expert, many passages sounded as if they were note for note and simply recycled. This has the unfortunate side effect of being a distraction for anyone who’s seen “Godzilla” a few times. Extras are light this time around-trailers for the three films in Kudo’s ‘Samurai Trilogy’, a handful of historical notes, short bios of some of the cast and crew, and a small image gallery (only five images). Toei must not have had much archival material on the film since not only is there a lack of stills on the disc but the trailer is one that Animeigo put together themselves. Otherwise, the disc is what we’ve all come to expect from Animeigo-a top rate translation with cultural notes onscreen, the best possible transfer, and solid sound. 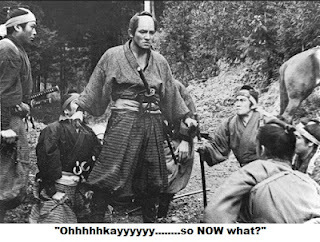 In the less innocent and more skeptical world of the 1960’s, it wouldn’t be Seven Samurai that would get the job done. It called for Eleven...Eleven Samurai who fought themselves and their clan leadership as much as they did the enemy. 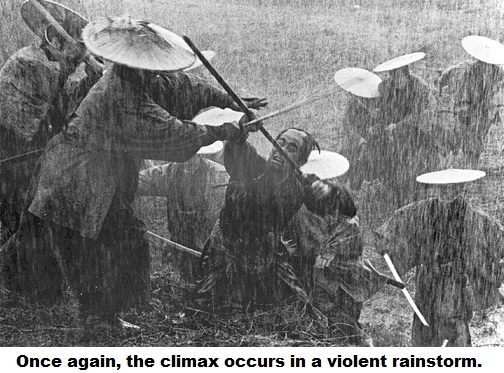 But when everything was said and done, they pulled together to attack their common enemy, concluding the Samurai Trilogy with an appropriately brutal and bloody finale. It combines the best of the classic jidaigeki of the 50’s with the increasingly violent large scale chanbara films of the 60’s.You can pick up Eleven Samurai at a discount on the Animeigo website or on Amazon. 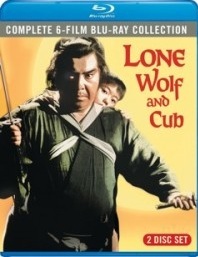 Speaking of brutal and bloody, while you’re there check out the “Lone Wolf & Cub” Blu-ray set-all six films in one nice package! We’ll be reviewing that in a couple of weeks.